The Tomorrow Lab is an award-winning agency that provides forward-thinking, results-driven solutions for businesses. In a world where digital is ever-changing, we offer clients a focused strategy that will position them effectively online and drive results for their business. Happy New Year everyone! I hope coming back to work hasn’t been too hard on you all. The following round-up post will help you get clued up on the social media updates you missed in the midst of Christmas shopping, parties and stuffing your face with turkey and mince pies in December. 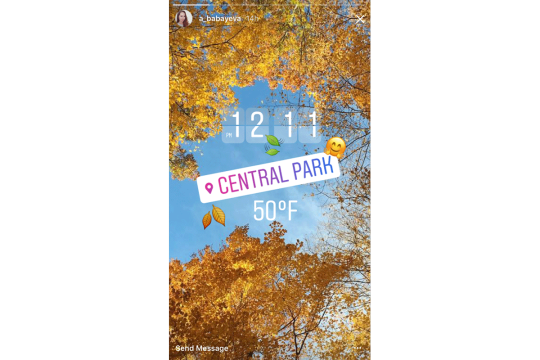 From the new Facebook Messenger Camera, going live on Twitter to updates to Instagram Stories and Snapchat’s creative tools. Happy Reading! You may have noticed Facebook Messenger’s new camera over the holidays, with art and special effects – similar to Snapchat and Instagram Stories. Facebook have realised that people are messaging eachother in a much more visual and engaging way, with 2.5 billion emojis, photos, stickers and videos being sent every day on Messenger. They acknowledged that the camera is now replacing the keyboard and have built a new Messenger camera enabling users to send fast, simple and fun photos and videos to their friends and family. The camera can be enabled through one tap on the shutter button on the center of the Messenger screen – a tap takes a photo and a press records a video. The camera has Snapchat-like filters called 3D masks and special effects. Facebook have also collaborated with a number of artists and influencers around the world to create thousands of stickers, frames, masks and effects. The pallette icon to the right of the shutter also allows you to create a message on a blank canvas adding art, frames and stickers to your text. All of the other features of Messenger have remained the same, so you can still send text only messages. You can read more about this update here. Easier Reporting – There is now a reason option of ‘It’s a fake news story’ and action of marking fake news when reporting content. Flagging Stories as Disputed – Facebook are providing more context for users, whereby content that has been reported will be flagged on the News Feed and checked by third-party fact checkers. Informed Sharing – Signals will be incorporated into ranking for outlier articles that are being read but not shared. Disrupting Financial Incentives for Spammers – When placing an ad Facebook have eliminated the ability to spoof domains. On the publisher side of things, Facebook are analysing websites to detect where policy enforcement actions might be necessary. This highlights the importance of sharing authentic and meaningful content on Facebook. You can read more about this here. Group video chat has now rolled out on Android, iOS and the desktop version of Messenger, making it easy to stay connected face-to-face with friends, family and colleagues all over the world. Twitter is making is easier to create live video experiences within the Twitter app, powered by Periscope. To #GoLive simply compose a Tweet then tap ‘LIVE’ which will bring up a pre-broadcast screen to frame your shot, then when you are ready press ‘Go Live’ to start broadcasting. Once live anyone on Twitter and Periscope can engage with your broadcast. Twitter are allowing select partners to create and share live 360 videos on Twitter, where you can get an inside look with well-known personalities and behind-the-scenes at exclusive events. A ‘LIVE 360’ badge mark these videos and users are able to interact with the video by changing what they see by moving their phone and swiping the screen. Similar to saving posts on Facebook, you can now save posts on Instagram you wish to revisit via the bookmark icon underneath posts in your feed. These will then save to a private tab on your profile. This enables Instagrammers to save a business, product or ad they want to remember. Stickers – After taking a photo or video you can choose from a variety of stickers to add context to your posts. Some stickers are even time, location, weather and holiday based. Drawing tools are also available to play about with. Hands-Free – If you are recording a video, you can now opt for a hands-free option which allows you to start recording with one tap, as opposed to holding down. More Text – You can add as much text to stories as you like, simply keep tapping the text button. There are also various options for formatting your text. Save your Story – On iOS you can now save your entire business story from the past 24 hours to your camera role as a single video. Mid-December saw Snapchat launch Groups, allowing users to communicate with up to 16 friends on Snapchat. A Group can be created when sending a Snap or when making a new Chat. Chat sent to a group are deleted after 24 hours and can be opened and replayed just once by each recipient. Snapchat have also instroduced two new creative tools – Scissors and Paintbrush. Scissors are used to cut out part of Snap on the Preview screen to turn into a sticker (pretty cool)! The Paintbrush can be used to creat artisitic masterpieces to Snaps in Memories.